Don Parsons and Nick Ferrell bought a ramshackle Victorian spinster and plan to transform her into a Painted Lady. Weddings and other parties are a part of their business plan. They’ll be hosting a small ceremony and reception for bride-to-be Lauren Washborne … except she doesn’t seem all that enthusiastic about her upcoming nuptials. Don wants to know why—but Nick is against the idea. Will Lauren have a chance to live happily ever after, or will her suitor be left at the altar? If so, may I suggest using it on books? And if you're so inclined, perhaps one or two of mine? You can check out my books on my websites: Lorraine Bartlett, L.L. Bartlett, and Lorna Barrett. \The next installment in this series is THE RELUCTANT BRIDE, coming on January 2nd and ready for pre-order. Want to read some reviews? Check them out on Goodreads. 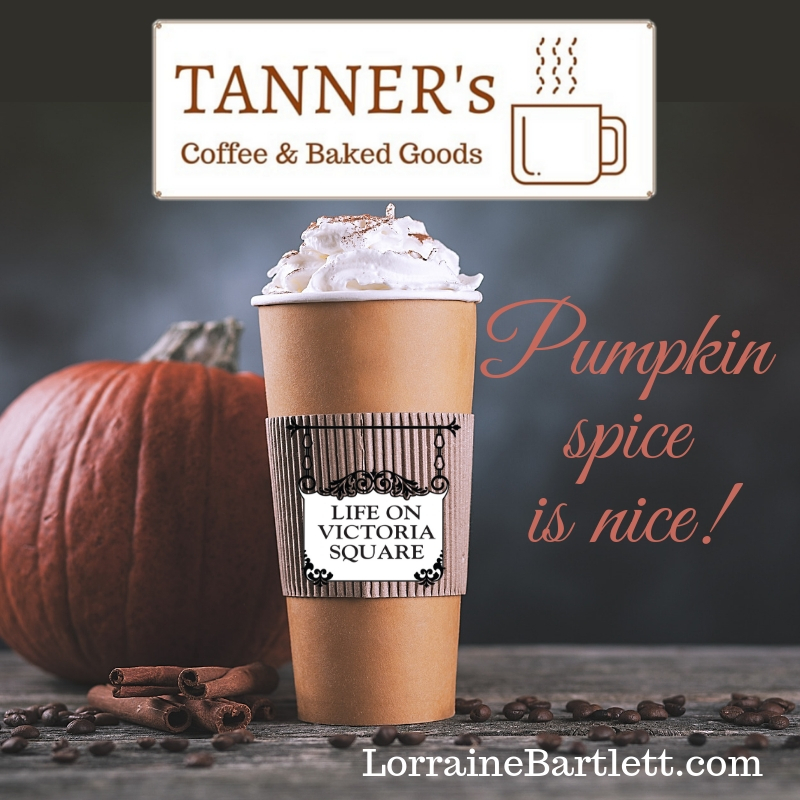 Hey, it's pumpkin spice time! Um...I'm not into pumpkin spice. I have tasted pumpkin pie, but didn't like it. (Tried more than once, so you've gotta give me that.) Never had a latte, let alone a pumpkin spice one. Never had a pumpkin spice cookie, muffin, cupcake, or meat pie. I like the idea of pumpkin spice, but can't think of anything that would entice me to eat/drink it. What do you think the whole pumpkin spice thing? Back in October, I put my latest Life On Victoria Square story, It's Tutu Much, for pre-order. But oddly enough, readers didn't seem interested in the story. I wondered if it was just the fact that the holidays were coming up, or if it might be the cover. My beta readers liked the story and they liked the cover. But when it came to debut day, the pre-orders were 2/3 less than the previous three stories. I kept focusing on the wrong aspect of the story. I kept thinking it was about the children in the dance class, but the more I thought about it, the story is really about their teacher, Dana Milton. I asked my review crew what they thought, and they were split. Some like the cover, some thought it looked like it was a children's story. I didn't like hearing the latter, but I had to listen. Although it's only been 10 days since the story has been out, the sales went right down the toilet. In fact, I've already had a couple of days without a single sale. That's not good. So yesterday, I asked the members of my Facebook Group (Lorraine's Perpetual Tea Party -- if you haven't joined--why not???) what they thought of the current cover and a dummy cover I put together. I'm no Photoshop wiz, and I couldn't get the ballet dancer to stay on a colorful background. After a lot of trial and error, I managed to get her on a gray background. Readers thought the covers were bland. They wanted color. They wanted a proper tutu. They wanted whimsy. They did NOT want a photo on the cover. The original cover didn't mesh with the other covers in the series. However, that didn't tell me what I needed to convey to my cover designer. So, I decided to let her decide what to do. I told her what the readers said, I showed her what I had done, and let her play with it. I love what she came up with. It's whimsical, it's bright, there's color -- and the ballet and tap shoes say there's more than just one kind of dance being taught in this studio. Being quickly able to correct something like this is one of the best things about being an indie author. Had this been a traditionally published story, it would have been stuck with a "bad" cover for eternity. I was able to turn it around in less than two weeks from publication. Now, see if you're more interested in the story. Dana Milton opens a dance studio on Victoria Square. 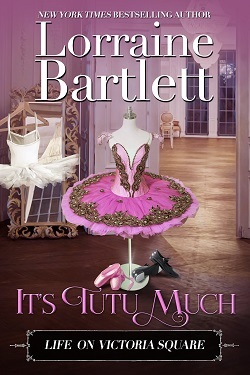 Can she teach her students kindness, respect, and shuffling off to Buffalo, or is it all tutu much? It's always a joy to open the boxes of ornaments and decide what to put up. I say that because here it is five days later and we still haven't opened two of the (VERY LARGE) boxes and the tree is just about full. (How did that happen?) I thought I might share a few of them with you. 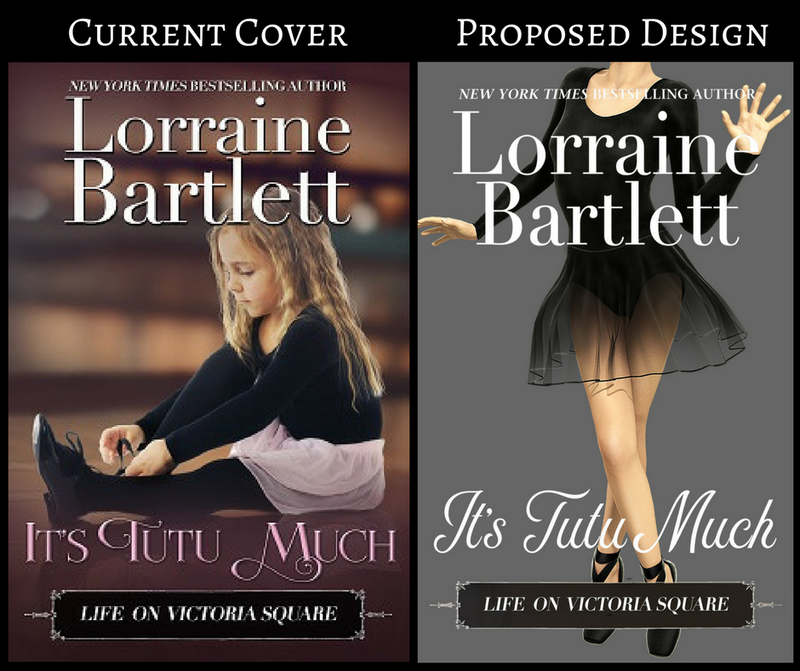 I recently wrote the 4th installment of the Life On Victoria Square series, It's Tutu Much, which revolves around a dance studio on Victoria Square. My mother collected a bunch of ballerinas to put on or under her Christmas tree. These two beauties were under the tree for at least a decade. I think my mother liked them because my niece was a dancer. In fact, she danced right through high school, when a lot of other girls might have made fun of her (I know when I was in high school the bullies taunted the girls who still went for tap and ballet). I wasn't a dancer. I loved to dance, but I remember at age 4 being forced to go to dance school and some of the other (younger) girls just didn't pay attention to the teacher who instructed us to dance to "I'm a Little Eskimo." I clearly remember telling my father, "That's just stupid and I won't do it." They took me to the recital and said, "Don't you wish you'd stuck with it?" and I said in no uncertain terms, "NO!" Still, I now wish I had stuck with it. (Perhaps it was because I so love the book Step Ball Change by Jeanne Ray, a story about a woman with a dance studio--and how her daughter's engagement changed the entire family.) And did I mention how much I love to watch videos of people tap dancing? 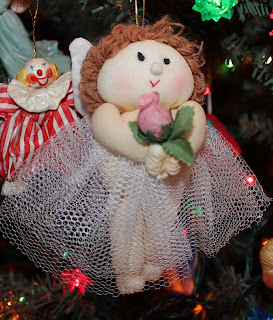 And I have a "tutu" story about one of my Mum's ornaments, too. She bought this little angel (right) at a yard sale. But, OH!, she was nekked! My Mum thought that just wasn't right, so she took a bit of netting and made her a tutu. Isn't she just adorable? I know she was one of my Mum's favorites, even though she cost less than a buck. 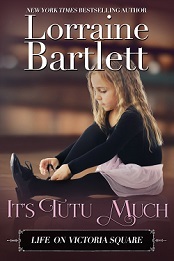 I wish my Mum could have read my story, It's Tutu Much (which will be available on January 2nd). I don't have a lot of ornaments that remind me of my books, but since I started writing the Lotus Bay Mysteries, I've been looking for swans. I found two, and they now don my tree. 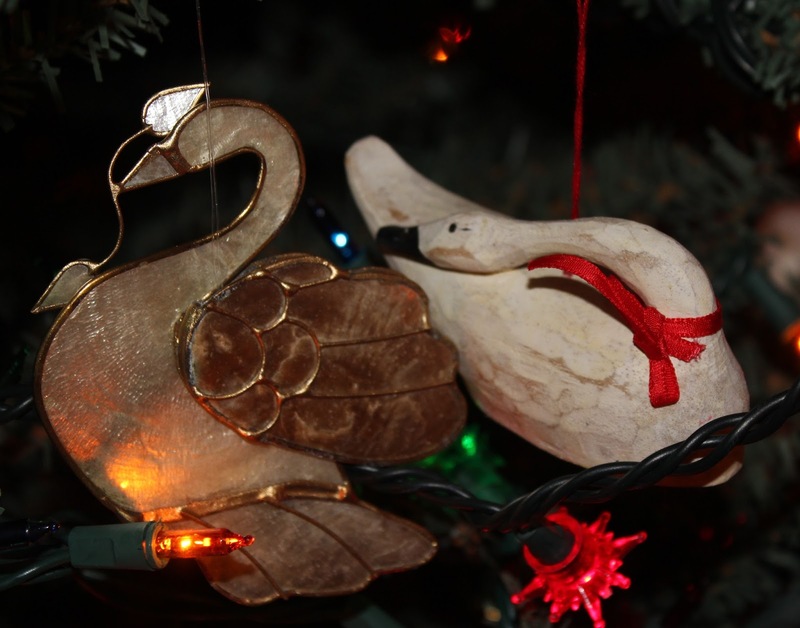 One is sort of a stained-glass ornament, and the other is a carved wooden (white) swan. I love them both, and they remind me of my short story, Christmas at Swans Nest (set on Lotus Bay). If you haven't read the "series," but you like Christmas, you can read this and it will stand alone. I've got lots of other cool ornaments, like this little white flat cat I got at a yard sale. It was painted onto a stone. Wow--I wish I had that kind of talent. How did someone see that there was a cat that could emerge from a piece of slate? Cool, huh? my eyes nearly popped out of my head when I looked at the price tag--TWENTY-FIVE BUCKS--but my mother said, "If you'd like it, I will buy it for you." I initially balked at the price tag, but then remembered what my friend Judy told me years before. "If your mother wants to buy you something, LET HER. Because (and Judy learned this through bitter experience) one day she won't be there." 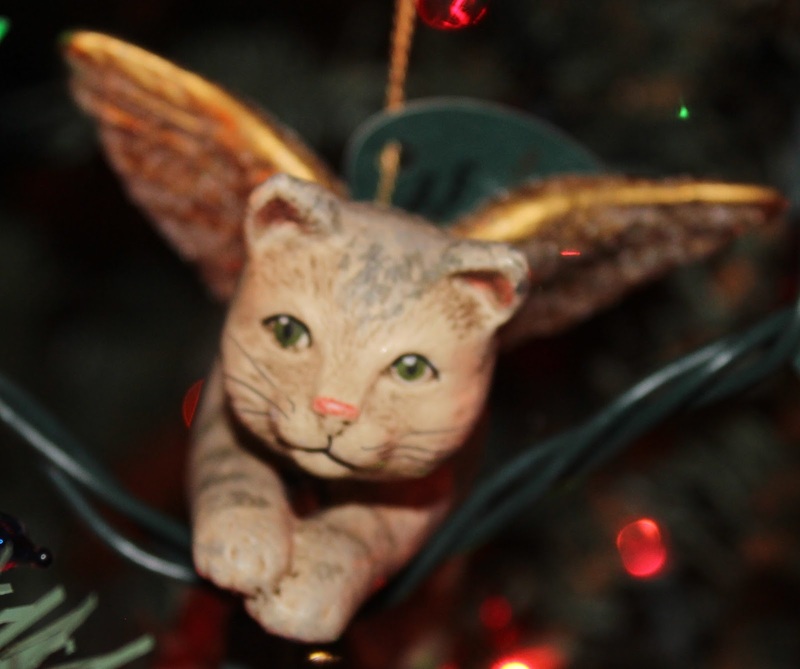 And now my Mum is gone, and I'm so glad I let her buy that little kitty for me because it's now one of my most treasured Christmas tree ornaments.Years later, I saw knockoffs in plastic for less than $5. But mine still has the original tag on it and is not only signed by the artist, but is so much prettier than any knock off. These are just a few of the ornaments on my tree. You can see many more on a Youtube video I made. Just click this link. 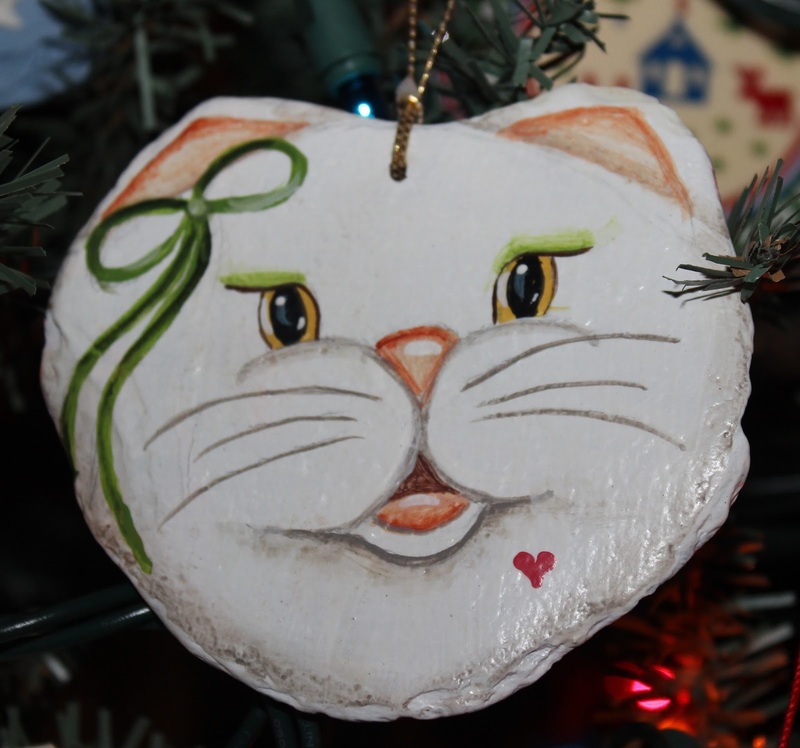 Have you got a special ornament that comes with a story? If so, please feel free to share it in the comments below. My Victoria Square Mystery series has had a few ups and downs. It came out like gangbusters in 2011--and bam bam--two of the books hit the New York Times bestsellers list. But then ... there was a nearly four-year lag from the time One Hot Murder came out and Dead, Bath and Beyond was published. A lot of readers forgot about Katie Bonner and Artisans Alley. I'm now writing the series with a co-author, but nobody told me my first co-author only had a one-book contract. I assumed we'd write the rest of the books in the contract together. Since her life had taken another turn, I had to find another author. Meanwhile, Victoria Square was once again taken out of the publishing schedule. My agent found the wonderful Gayle Trent (who also writes as Gayle Leeson and Amanda Lee), and we're hard at work on the next book in the series. (So far not titled.) We're back on the publishing schedule, but not until December 2018. That's 18 months from now. So the big question is -- will readers forget about Katie and Artisans Alley once again? Hopefully not -- because I've begun a companion series called LIFE ON VICTORIA SQUARE. In the Victoria Square Mysteries, Artisans Alley takes center stage, but the merchants--and their businesses--are just as intriguing. They all have stories to tell ... and that's what the Life on Victoria Square companion series is all about. I began the series featuring Ray Davenport, the former homicide detective who has retired and opened a gift shop on Victoria Square. 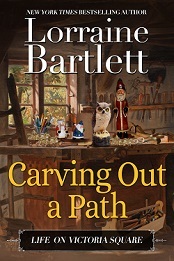 In CARVING OUT A PATH, a young shoplifter not only swipes a couple of hand-carved figurines from Ray's Wood U shop, but barrels into and injures Katie Bonner, manager of Artisans Alley. Upon his escape, the police are called, but before the ink is dry on the report, the boy’s grandmother drags the would-be thief back to return the purloined items. She’s got an agenda and great expectations. Can Ray come through in a pinch? 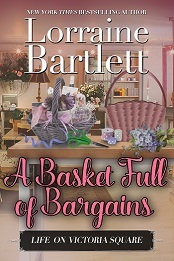 The second installment, A BASKET FULL OF BARGAINS, comes out on Tuesday. This one features Gilda Ringwald-Stratton, owner of Gilda's Gourmet Baskets. Iris Drake is an odd duck. She knows everyone at Artisans Alley arts-and-crafts arcade, but nobody knows her. When she walks into Gilda’s shop on Victoria Square, she’s a stranger there, too—but not for long. Yet she hasn’t to come to Gilda to buy her wares—she’s there to sell some of her own. All goes well until Iris’s secret is exposed. Should Gilda step in to make things right, or walk away from an unpleasant situation? 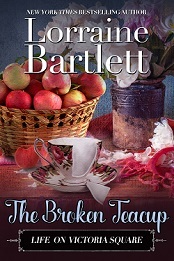 I've already written a third story (now available for Pre-Order, and to be published on September 8th) called THE BROKEN TEACUP. I hadn't meant to feature Katie Bonner in any of the stories in this series, but I was inspired by a teacup I bought an an estate sale. Katie Bonner needs a pick-me-up one cold and gloomy fall day, and the US Mail delivers—literally. A mysterious package arrives at Artisans Alley with her name on it, but the return address is obscured and the treasure inside, a beautiful bone china teacup, is broken. Before Katie can open the accompanying card, she’s called away and one of the vendors mistakes the package for trash. Katie makes a quick rescue, but the card is gone. 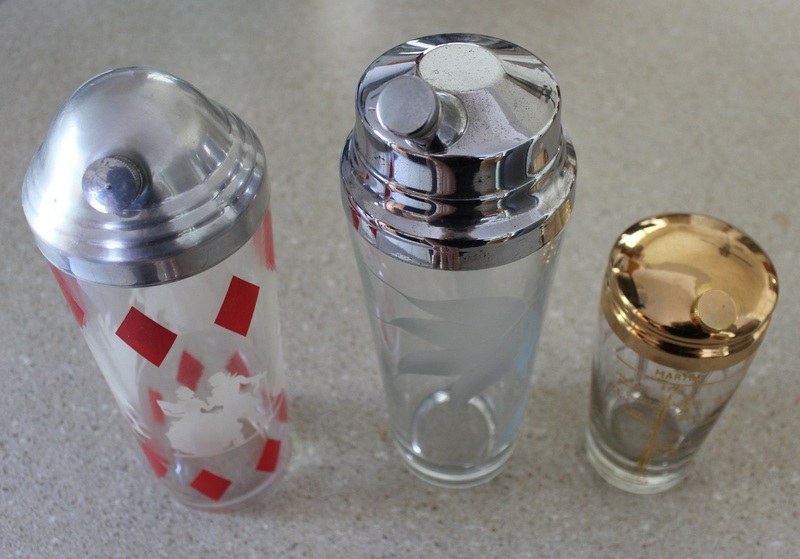 Who sent the cup? What is its significance? Can Katie solve this mini mystery? I'm already plotting the next story, which will come out in either late December or early January. My goal is to write a new story every three months -- at least until the new novel comes out. If you've enjoyed the Victoria Square Mysteries, perhaps you'll enjoy Life On Victoria Square, too. To find out more about the stories, please check out my website. To check out my videos, please visit my Youtube Channel. 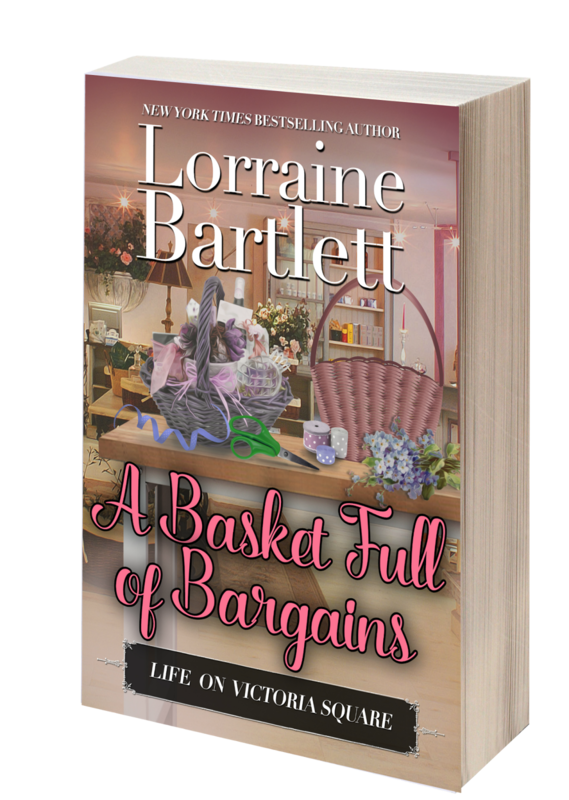 Get yourself A Basket Full of Bargains! YAY -- the 2nd installment in Life On Victoria Square series, A BASKET FULL OF BARGAINS, is now available! Iris Drake is an odd duck. She knows everyone at Artisans Alley arts-and-crafts arcade, but nobody knows her. When she walks into Gilda’s Gourmet Baskets on Victoria Square, she’s a stranger there, too—but not for long. Yet she hasn’t to come to Gilda to buy her wares—she’s there to sell some of her own. All goes well until Iris’s secret is exposed. Should Gilda step in to make things right, or walk away from an unpleasant situation? I hope you'll enjoy Gilda's story! There's always a little bit of me in there. One of the fun things about writing is you can incorporate tiny pieces of your life into your stories. There was a time when I hated to shop. (Yeah, sounds weird now.) Of course, I still hate to shop for certain things. (Like clothes. No matter what I buy, I always look like a barrel. Yeah, hate clothes shopping.) One of the reason I became a vendor at an antiques and crafts arcade was because I loved to shop there. I was furnishing our home and they had the best stuff! That's about the time I also started to go junking (which sounds a lot cooler than saying I went to yard sales). But (as usual) I digress. I'm working on my second Life on Victoria Square story (A companion series to go with The Victoria Square Mysteries) featuring a minor character who has shown up in a couple of the Victoria Square Mysteries. We're talking a walk-on character who never even had a line of dialogue. But she stuck in my mind and I knew she had a story to tell ... I just didn't know what it was until this week, that is. She didn't even have a name. They just referred to her as "the woman who never pays more than a buck for anything." And what's her claim to fame? 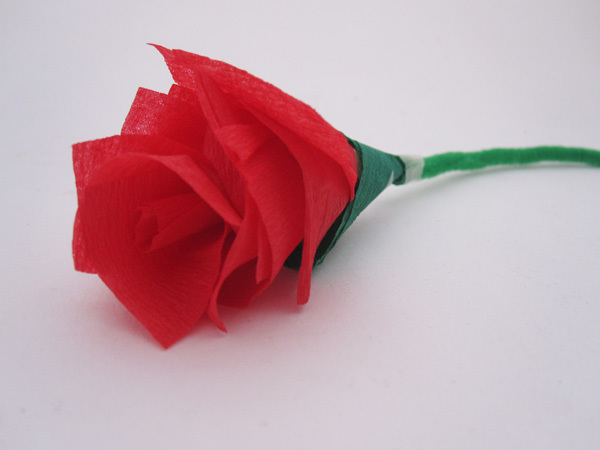 A rose made of crepe paper. I'm having fun describing all the treasures she's picked up while shopping at Artisans Alley and I hope my readers will enjoy getting to know her, too. The first Life on Victoria Square story goes on sale on Tuesday. It's called CARVING OUT A PATH, and features Ray Davenport, the cranky police detective who clashed with Katie in the first three novels. A young shoplifter not only swipes a couple of hand-carved figurines from Ray Davenport, owner of Victoria Square’s Wood U gift shop, but barrels into and injures Katie Bonner, manager of Artisans Alley. Upon his escape, the police are called, but before the ink is dry on the report, the boy’s grandmother drags the would-be thief back to return the purloined items. She’s got an agenda and great expectations. Can Ray come through in a pinch? I have plans to write about all the merchants on Victoria Square. I hope you'll give Ray (and later Iris) a chance!